Traditional academic curriculum – similar to the a syllabus approach, is based on the belief that students have to be initiated into established subjects and that learning requires discipline, hard work and that not all will be able to achieve to the same level of ability. Outcomes based education (OBE) – is an opposition to either the syllabus or a standards approach to curriculum. Australia has adopted OBE. In defining what it is to be taught, an OBE approach utilizes all the characteristics of progressive education (student centered, process-driven and non competitive) while outcomes are generally vague, ambiguous and hard to measure. 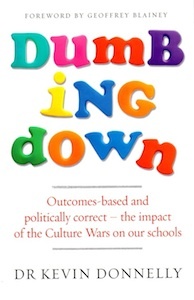 Political correctness – left-wing teachers argue that education must be used to challenge the status quo and as an instrument to indoctrinate students into what is deemed politically correct in areas like environment, multiculturalism, gender issues and the class war.